Shiso is one of my favorite herbs, right up there with basil. Here on FOODjimoto.com, I've added shiso to pesto in my Umeboshi and Shiso Pesto post, and to my mother's recipe for Stuffed Chicken Rolls with Shiso & Umeboshi. 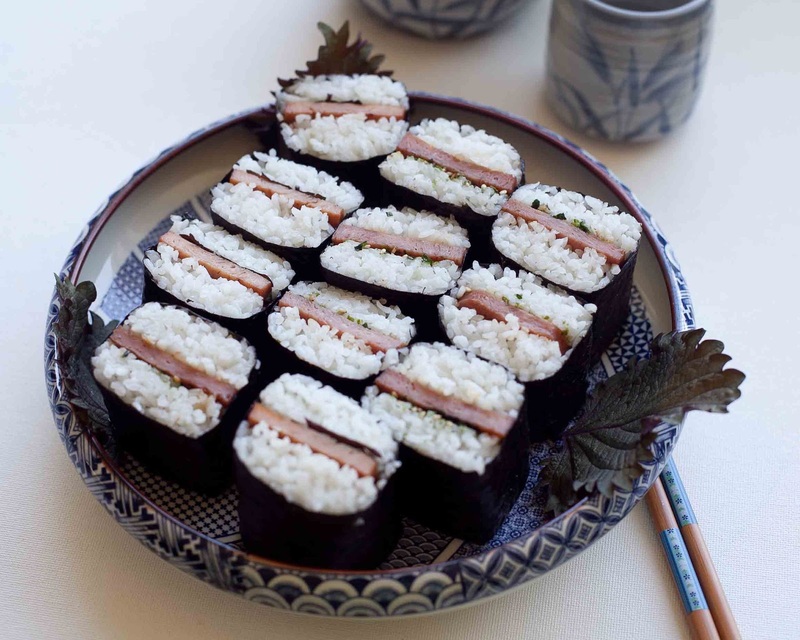 This time, I've added shiso leaves to Spam Musubi. For several years I've tried to grow shiso with no success until this year. I bought several packages of seeds from the Kitazawa Seed Co. I've included the links to the Kitazawa Seed Co.'s pages for the different varieties--take a look if you'd like to know more about shiso. This is the green variety, above, called Ao Shiso. I couldn't grow it before, but this year I soaked the seeds in water for two days, drained the water and let the seeds sit until they cracked and a root formed. Then I planted them and they sprouted nicely! This variety is the one I've most seen in sushi bars. 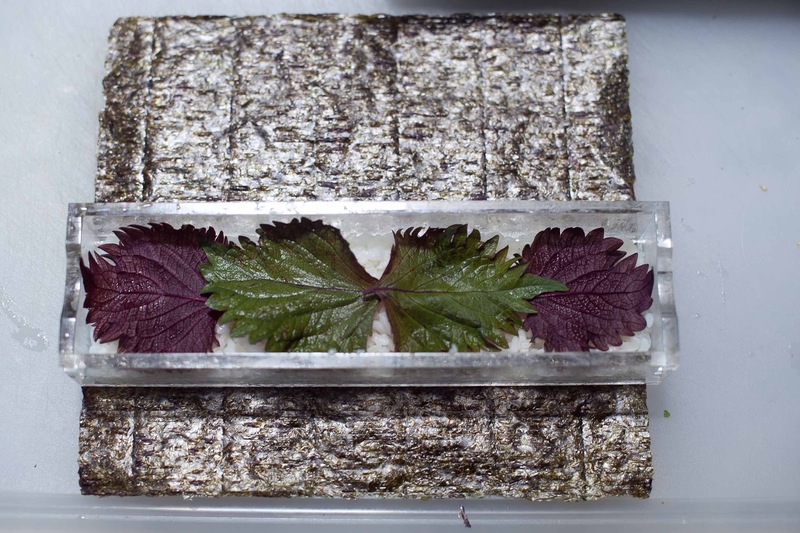 The red variety, or Aka Shiso, is the variety used to color umeboshi (Japanese pickled plum) and also found in some tsukemono (pickled vegetables). This variety is called Hojiso. The leaves are green in front and red in back. I haven't seen this one before and thought I'd try it. It grows fast, like basil. 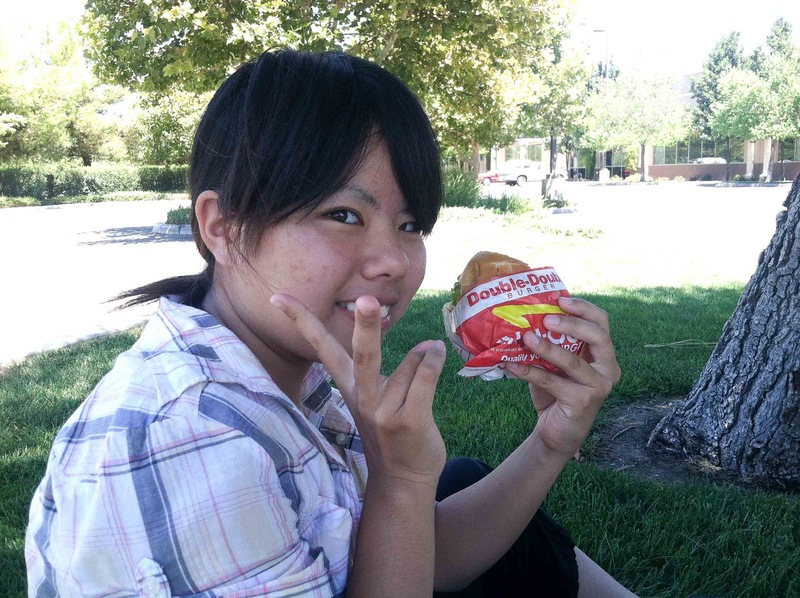 This is Ayako. She is a relative visiting from Osaka, Japan. 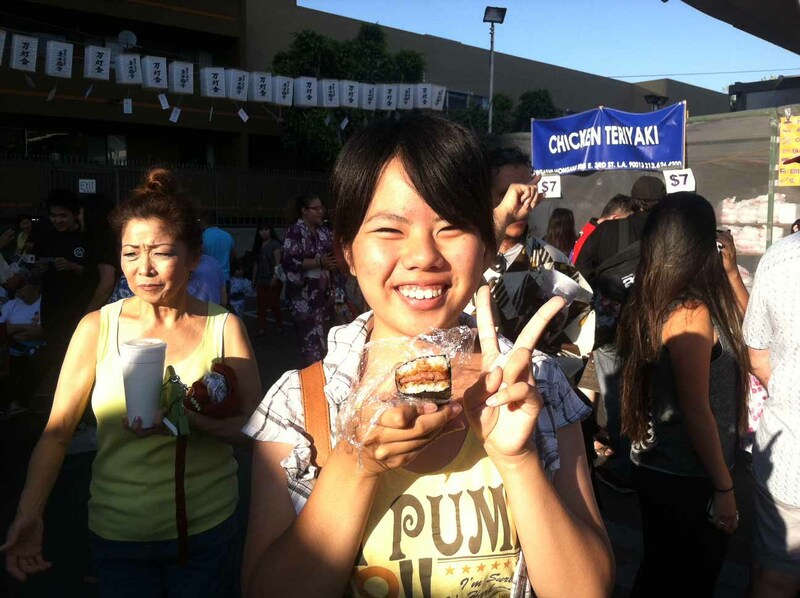 Ayako tried spam musubi for the first time at the Higashi Obon. You may remember Ayako from the Chocolate Cupcakes--Magnolia Bakery's Recipe post that had some photos of Rick & Jessica's honeymoon trip to Japan, and their visit with Ayako's family in Osaka. 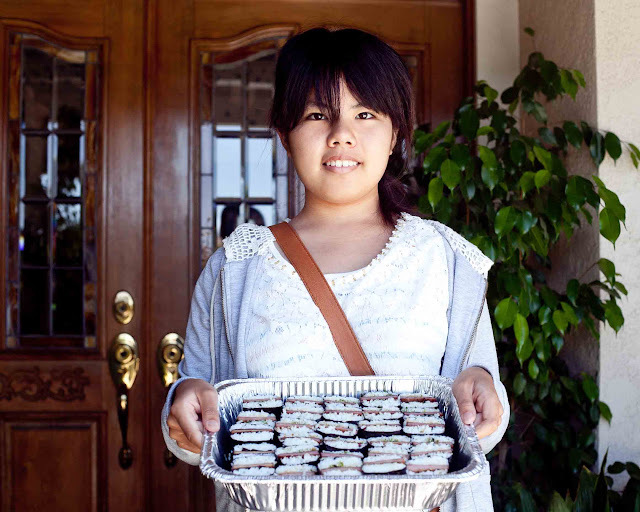 We decided to make some spam musubi the next day, since Ayako liked it so much! Basic instructions on making spam musubi can be found on our Spam Musubi post. 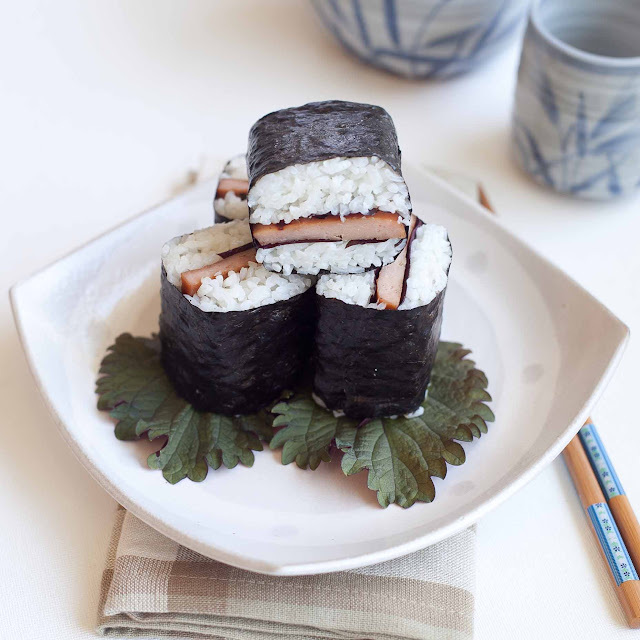 To add the shiso leaves, simply place them on top of the rice before adding the spam. If you're really a fan of shiso like me, you may want to add them on top of the spam too. 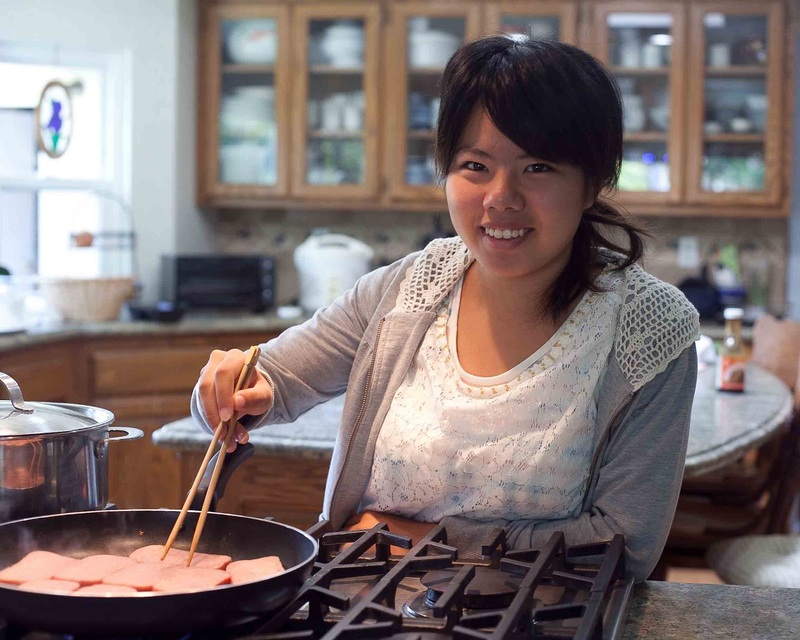 Ayako made hers without shiso--turns out she is not a fan. She took them to Auntie Tsuyuki's 98th birthday party. 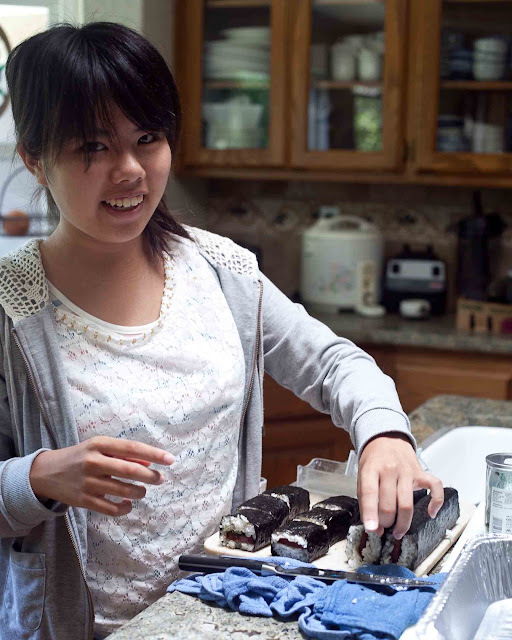 It was fun making spam musubi with you, Ayako! 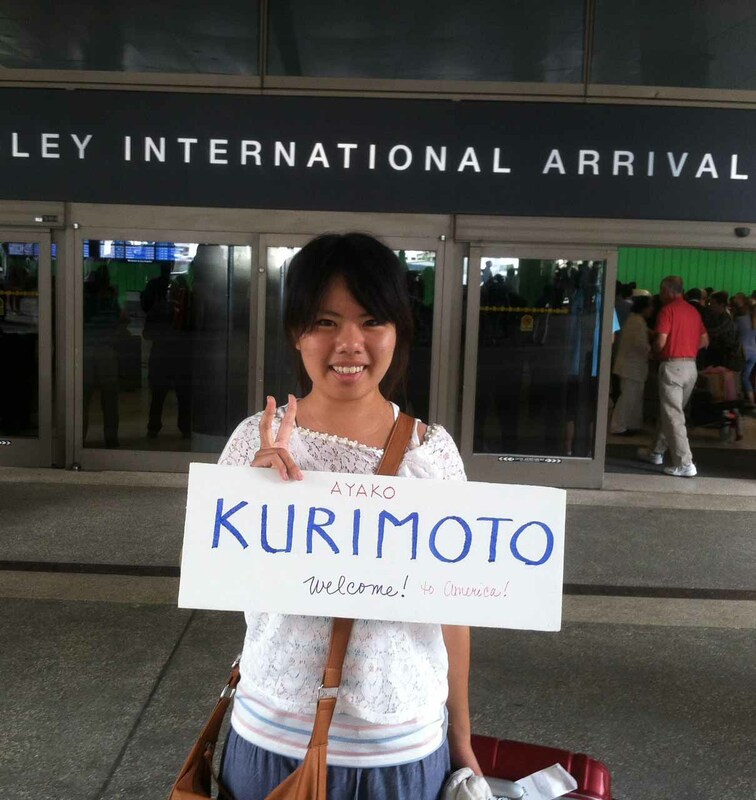 When we picked up Ayako at the airport, she saw our sign, came up and introduced herself and greeted us with a big smile. 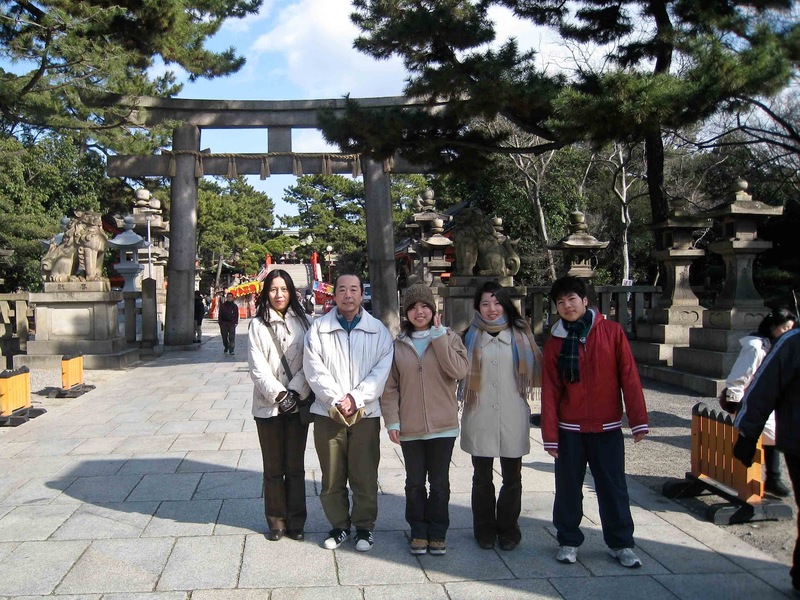 Ayako's father went to college in the US and lived here for several years. 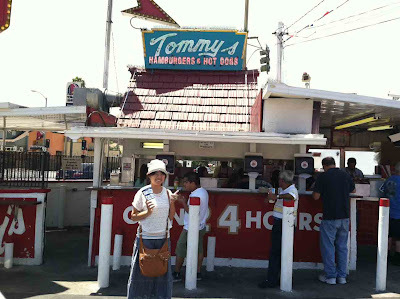 One of the things he wanted Ayako to try was a Tommy's burger, one his favorites. 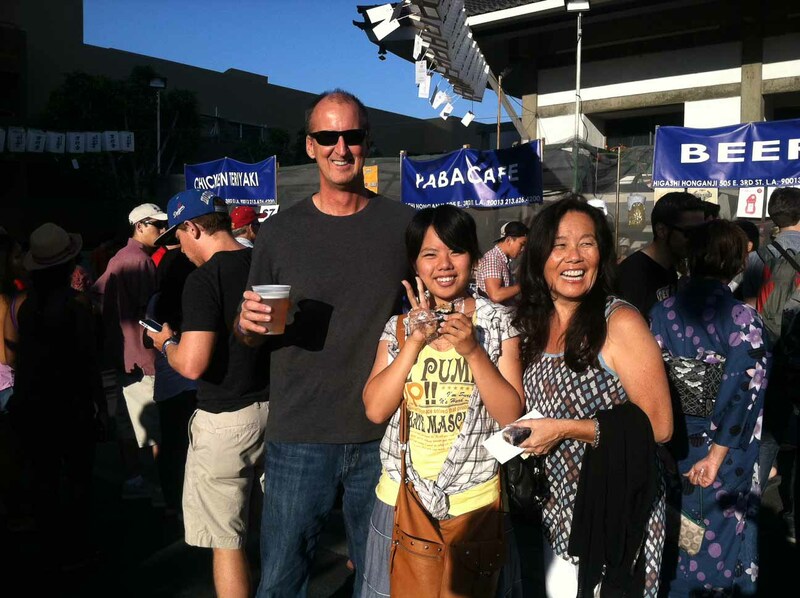 We had a good time at the Higashi Obon with Bill and Nancy. Ayako and Nancy even danced the bon odori. 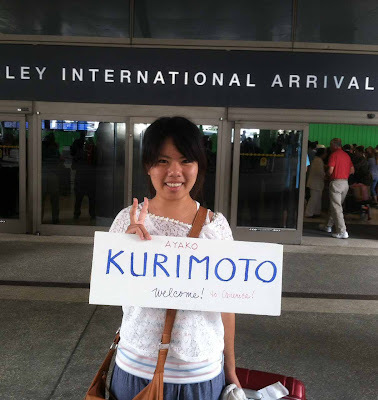 Ayako leaves for Japan soon. It was nice meeting you, Ayako. We had a lot of fun! Hope to see you again! Yum!! 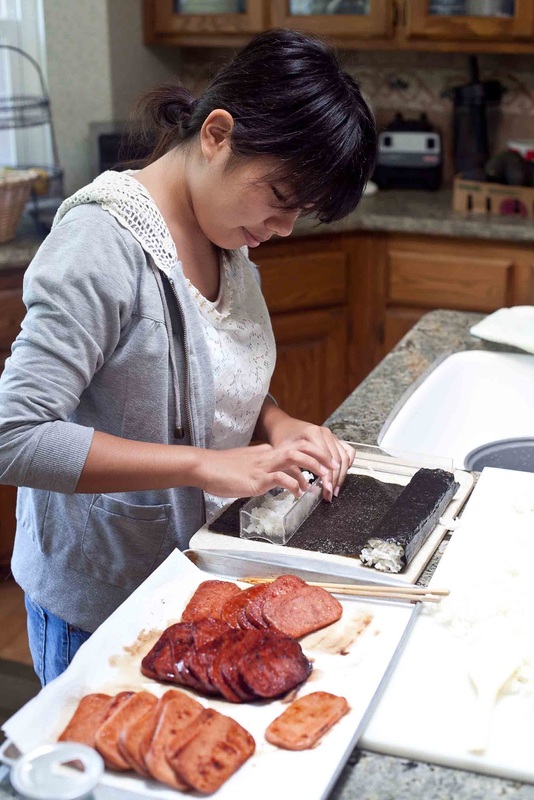 Spam musubi!! I love the twist with the shisho leaves!